The Roger Madura's latest issue is out (PDF). Open Health Tools, Inc. is a consortium formed by organizations in Australia, Canada, UK and the US to promote the use of open source software in health care. This initiative is based on the model of the Eclipse Foundation, a community of open source software developers. Skip McGaughey, a co-founder of Ottawa-based Eclipse, is executive director of Asheville, N.C.-based Open Health Tools. The Web is abuzz with news about the recent launch of the Google App Engine. But some are looking at the limitations: only the first 10,000 developers who signed up for the beta launch will be able to deploy apps, and there will be limits on usage. One current limitation is a requirement that applications be written in Python, a popular scripting language for building modern web apps (Ruby and PHP are among others widely used). Google says that Python is just the first supported language, and that the entire infrastructure is designed to be language neutral. Google’s initial focus on Python makes sense because they use Python internally as their scripting language (and they hired Python creator Guido van Rossum in 2005). Actually this is encouraging for me since I just recently started making the transition to Python. Update: Dave says "Python is the new BASIC." 3. Now, what Google announced is really exciting! I'm not kidding. It's even better than I hoped. Yes, it's only Python, but IBM's PC-DOS was only BASIC and Pascal when it first came out, and it didn't matter. Yeah, I preferred C, but I coded in Pascal because that's what you had to do to get an app running. What you're going to see here that you've never seen before is shrinkwrap net apps that scale that can be deployed by civillians. That's a mouthful, but that's what's coming. Why? Because here is a standardized platform that can be stamped out in the billions of units. Maybe Google can't do it, but the perception is that they can. Who is willing to stand up and say Google hasn't nailed scaling? What PCs did in the 80s, Google is doing now. PCs took the black magic out of owning a computer. Now Google is taking the black magic out of operating a scalable web app. Python is the new BASIC. 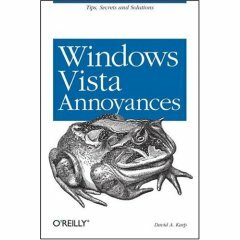 The good news is that this book by David A. Karp will walk you through solutions for the most common problems encountered with Windows Vista. The bad: for the most part, you have to fool with the registry. Good luck, and tread carefully.